Dental composite formulations have been continuously evolving ever since Bis-GMA was introduced to dentistry by Bowen in 1962. Recent developments in material science technology have considerably improved the physical properties of resin-based composites and expanded their clinical applications. Dental restorative composite materials can be divided into direct and indirect resin composites (IRC). IRCs are also referred to as prosthetic composites or laboratory composites. These materials offer an esthetic alternative for large posterior restorations. There are a plethora of materials available nowadays. Dental resin composites were introduced initially for use as anterior restorative materials. Later, with technological improvements, the prospect of restoring posterior teeth with composite was introduced. Though there are numerous causes for failure of clinical restorations made of direct composites, the major cause with the earlier posterior composites was poor wear resistance. , While the newest direct composite resins offer excellent optical and mechanical properties, their use in larger posterior restorations is still a challenge since polymerization shrinkage remains a concern in cavities with high C-factor. Though there have been numerous advances in adhesive systems, it is observed that the adhesive interface is unable to resist the polymerization stresses in enamel-free cavity margins. , This leads to improper sealing, which results in microleakage, postoperative sensitivity, and recurrent caries. The achievement of a proper interproximal contact and the complete cure of composite resins in the deepest regions of a cavity are other challenges related to direct composite restorations. Various approaches have been developed to improve some of the deficiencies of direct-placement composites. , However, no method has completely eliminated the problem of marginal microleakage associated with direct composite. , IRCs were introduced to reduce polymerization shrinkage and improve the properties of material. Touati and Mφrmann introduced the first generation of IRCs for posterior inlays and onlays in the 1980s. Direct resin composites were composed mostly of organic resin matrix, inorganic filler, and coupling agent. The first-generation IRCs had a composition identical to that of the direct resin composite marketed by the same manufacturer and the materials also bore names similar to that of the direct materials. The composite material is condensed into the cavity after the separating medium is applied to the cavity. This separating medium helps in easy removal of the inlay after the initial intraoral curing. The restoration is then subjected to extraoral light or heat tempering in an oven. DI-500® Oven (Coltene Whaledent) or a Cerinate® Oven (Den-Mat Corp) can be used at 110°C for 7 min. This technique eliminates the need for an impression of the cavity and the procedure can be completed in a single sitting. Brilliant DI® (Coltene Whaledent) and True Vitality® (Den-Mat Corp) are examples of material that uses both light and heat for this technique. The inlay is fabricated in a die. After the separating medium is applied to the die, composite material is condensed in increments into the cavity and light cured for 40 sec for each surface. The inlay is then removed and heat cured in an oven at 100°C for 15 min (CRC-100 Curing Oven® , Kuraray). The advantage of this technique is that the proximal contours can be achieved appropriately. One of the first materials introduced by Ivoclar was SR-Isosit® , which was marketed as Concept® in the US. This system uses a hydropneumatic heat cure in the Ivomat® apparatus. The polymerization takes place in water at 120°C and a pressure of 6 bar for 10 min. Another example of indirect material is Clearfil CR Inlay® (Kuraray),which uses light and heat for the indirect technique. Conquest® (Jeneric/Pentron), EOS® (Vivadent), and Dentacolor® (Kulzer) use only heat for additional curing, whereas Visio-Gem® (ESPE-Premiere) uses heat and vaccum for additional curing. It is possible to use any posterior composite for indirect techniques with additional curing. First-generation composites showed poor In vitro and clinical performance. Deficient bonding between organic matrix and inorganic fillers was the main problem leading to unsatisfactory wear resistance, high incidence of bulk fracture, marginal gap, microleakage, and adhesive failure in the first attempts to restore posterior teeth. Measures to solve these problems included increasing of inorganic filler content, reduction of filler size, and modification of the polymerization system. Even additional light curing extraorally did not efficiently improve the degree of conversion. Thus, specific conditions like heat, vacuum, pressure, and oxygen-free environment are utilized for polymerization of second-generation IRCs. The various techniques used for additional cure are desribed below. Air, because it contains oxygen, tends to inhibit polymerization and also plays an important role in the apparent translucency or opacity of the cured resin restoration. Oxygen entrapment in the restoration tends to break up or diffract natural light as it reflects from the surface of the restoration. Removing all of the encased air causes the restoration to become considerably more translucent. Entrapped oxygen increases the wear rate by weakening the wall around it. Nitrogen pressure eliminates internal oxygen before the material begins to cure. This influences the degree of conversion, esthetics, wear, and abrasion. BelleGlass® and Sculpture Plus® employ this method of curing in a nitrogen bell. The concept of slow curing described by Mehl  is based upon the concept that a slower rate of curing will allow a greater level of polymerization. Faster rates of polymerization tend to prematurely rigidify the newly formed polymerized branches. Such a condition will increase their stiffness, disallowing further propagation of the molecule. Such a concept is incorporated in the curing process for both belleGlass® and Cristobal® . Electron beam irradiation is another method described for improving the composite's properties. This methodology is used with polymers like polyethylene, polycarbonate, or polysulfone. The two main reactions that occur when a polymer is subjected to electron beam irradiation are chain breakage and chain linkage. When breakage of chains occurs at the region of entanglement, there is induction of dense packing. This influences the bond between the filler and matrix, thus improving the mechanical properties and increasing success rates. The possible disadvantage of this method is polymer degradation and discoloration of the resin. The radiation dosage usually given is 200 KGy, but lower dosage like 1 KGy also has been shown to improve the properties. Due to economic reasons it is impossible to irradiate single crowns or FPDs. Behr and Rosentritt demonstrated that irradiated raw materials of composites can be mixed with new material to improve properties. Fiber-reinforced composites were introduced by Smith in the 1960s. Polyethylene fibers,  carbon/graphite fibers, Kevlar® , and glass fibers ,, were tested. Glass and polyethylene are the commonly used fibers in dentistry. Fibers act as crack stoppers and enhance the proprety of composite. The resin matrix acts to protect the fiber and fix their geometrical orientation. , Boron oxide, a glass-forming agent is present at 6-9 wt% in E-fibers and <1 wt% in S-fibers. E- and S-fibers are the ones most commonly used in dentistry. , The details of the FRC are shown in [Table 1]a and b. , The fibers can be arranged in one direction (unidirectional), with the fibers running from one end to other in a parallel fashion. Alternatively, the fibers can be arranged in different directions to one another, resulting either in a weave- or mesh-type architecture. When the directional orientation of the fiber long axis is perpendicular to the applied forces, it will result in strength reinforcement. Forces that are parallel to the fiber orientation will produce matrix-dominated failures and consequently yield little reinforcement. Multidirectional reinforcement is accompanied by a decrease in strength in any one direction when compared with unidirectional fiber. The mechanical properties of secon-generation IRCs, as assessed in various studies, [9, 29, 51, 57-63] are presented in [Table 3]. Krecji and colleagues demonstrated that Artglass® was considerably more wear-resistant than conventional light-cured composite resins. Charisma® , a conventional composite resin, exhibits an average annual wear rate of only 8 μ, while the Artglass® formulation exhibits only 50%-60% this amount. The substantial increase in wear resistance of the indirect material can be attributed in part to the incorporation of multifunctional monomers, which permits better control over the positions along the carbon chain where the cross-linking does occur. Consequently, this can aid in improving the wear resistance and the other physical and mechanical properties of the resin matrix. A change in concentration of Bis-GMA can also improve the wear resistance. Faria et al. observed that the wear resistance and hardness of Artglass® detroriates on immersion in water, whereas that of Solidex® does not. Freund and Munksgaard have found that there is a hydrolytic action of the esterase enzyme on resin restorations in the oral environment. 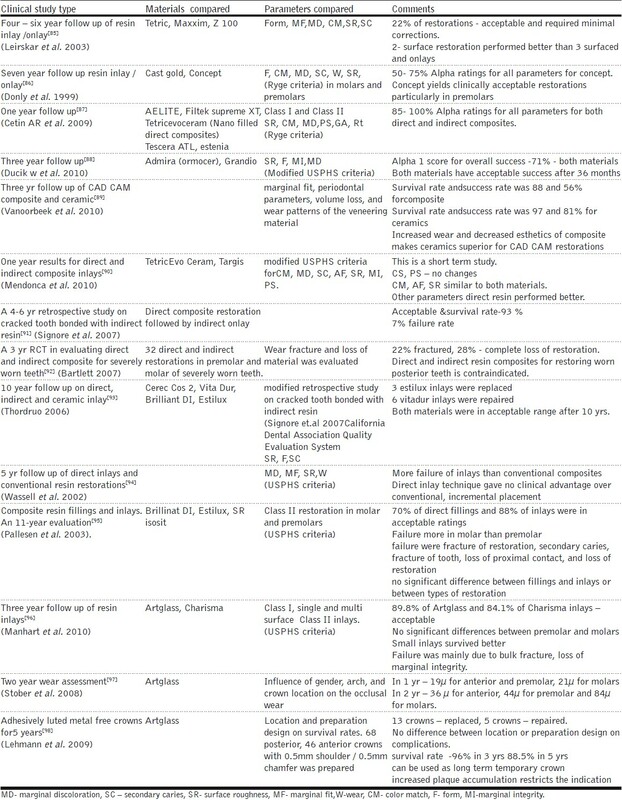 Our literature review shows that there are numerous IRCs available nowadays. These materials perform well in In vitro and short-term In vivo studies. It is also apparent that IRCs can effectively supplement the use of ceramics in certain clinical conditions. The improvement in properties due to the additional polymerization, which was observed in these studies, needs to be assessed with long-term clinical trials. In the absence of multiple long-term studies, the survival rate of IRC restorations cannot be assessed. Further clinical research is needed to evaluate the success rates with these newer IRCs. 1. Jackson RD, Morgan M. The new posterior resins and a simplified placement technique. J Am Dent Assoc 2000;131:375-83. 2. Dietschi D, Scampa U, Campanile G, Holz J. Marginal adaptation and seal of direct and indirect Class II composite resin restorations: An In vitro evaluation. Quintessence Int 1995;26:127-38. 3. Loguercio AD, Bauer JR, Reis A, Grande RH. Microleakage of packable composite in Class 2 restorations. Quintessence Int 2004;35:29-34. 4. Thonemann B, Federlin M, Schmalz G, Glunder W. Total bonding vs selective bonding: Marginal adaptation of Class 2 composite restorations. Oper Dent 1999;24:261-71. 5. Carvalho RM, Pereira JC, Yoshiyama M, Pashley DH. A review of polymerization contraction: The influence of stress development versus stress relief. OperDent 1996;21:17-24. 6. Davidson CL, Feilzer AJ. Polymerization shrinkage and polymerization shrinkage stress in polymer-based restoratives. J Dent 1997;25:435-40. 7. Loguercio AD, Reis A, Mazzocco KC, Dias AL, Busato AL, Singer JM, et al. Microleakage in Class 2 composite resin restorations: Total bonding and open sandwich technique. J Adhesive Dent 2002;4:137-44. 8. Leinfelder KF. Indirect posterior composite resins. Compend Contin Educ Dent 2005;26:495-503. 9. Miara P. Aesthetic guidelines for second-generation inlays and onlay composite restorations. Prac Periodont Aesthet Dent 1998;10:423-31. 10. Asmussen E. Factors affecting the quantity of remaining double bonds in restorative resin polymers. Scandinavian J Dent Res 1982;90:490-6. 11. Burke FJ, Watts DC, Wilson NH, Wlson MA. Current status ans rationale for composite inlays and onlays. Br Dent J 1991;70:s269-73. 12. Garber DA, Goldstein RE. Porcelain and Composite inlays and onlays. Illinois: Quintessence Publishing Co Inc; 1994. p.117-33. 13. Peutzfeldt A. Indirect Resin and Ceramic Systems. Oper Dent 2001;200:1153-76. 14. Asmussen E, Peutzfeldt A. The effect of secondary curing of resin composites on the adherence of resin cement. J Adhesive Dent 2000;2:315-8. 15. Ferracane JL, Hopkin JK, Condon JR. properties of heat treated composites after aging in water. Dent Mater 1995;11:354-8. 16. Bagis YH, Rueggeberg FA. The effect of post-cure heating on residual, unreacted monomer in a commercial resin composite. Dent Mater 2000;16:244-7. 17. Wendt SL. The effect of heat used as a secondary cure upon the physical properties of three composite resins. 2. Wear, hardness, color stability. Quintessence Int 1987;18:351-6. 18. O'Neal SJ, Miracle RL, Leinfelder KF. Evaluating interfacial gaps for esthetic inlays. J Am Dent Assoc 1993;124:48-54. 19. Wendt SL, Leinfelder KF. Three year clinical evaluation of a heat-treated resin composite inlay. Am J Dent 1992;5:258-62. 20. Soares CJ, Soares PV, Pereira JC, Fonesca RB. Surface treatment protocols in the cementation process of ceramic and laboratory processed composite restorations. A literature review. J Esthet Restor Dent 2005;17:224-35. 21. Touati B, Aidan N. Second-generation laboratory composite resins for indirect restorations. J Esthet Dent 1997;9:108-18. 22. Ferracane JL, Condon JR. Post-cure heat treatments for composites: Properties and fractography. Dent Mater 1992;8:290-5. 23. Eldiwany M, Powers JM, George LA. Mechanical properties of direct and post-cured composites. Am J Dent 1993;6:222-4. 24. Viljanen EK, Skrifvars M, Vallittu PK. Dendritic copolymers and particulate filler composites for dental applications: Degree of conversion and thermal properties. Dent Mater 2007;23:1420-7. 26. Mehl A, Hickel R, Kunzelmann KH. Physical properties and gap formation of light-cured composites with and without 'softstart polymerization'. J Dent 1997;25:321-30. 27. Behr M, Rosentritt M, Faltermeier A, Handel G. Electron beam irradiation of dental composites. Dent Mater 2005;21:804-10. 28. Greer RW, Wilkes GL. Apparent reversal of physical aging by electron beam irradiation-furthur investigations. Polymer 1998;39:4205-10. 29. Vaishnavi C, Kavitha S, Lakshmi Narayanan L. Comparison of the fracture toughness and wear resistance of IRCs cured by conventional post curing methods and electron beam irradiation. J Cons Dent 2010;13:152-5. 31. Meiers JC, Freilich MA. Conservative anterior tooth replacement using fiber reinforced composite. Oper Dent 2000;25:239-43. 32. Imai T, Yamagata S, Watari F, Kobayashi M, Nagayama K, Toyoizumi H, et al. Temperature dependence of the mechanical properties of FRP orthodontic wires. Dent Mater 1999;18:167-75. 33. Vallittu PK. A review of fiber reinforced denture based resins. J Prosthodont 1996;5:270-6. 35. Van Heumen CC, Kreulen CM, Bronkhorst EM, Lesaffre E, Creugers NH. Fiber reinforced dental composites in beam testing. Dent Mater 2008;24:1435-43. 36. Vallittu PK, Ruyter IE, Erkstand K. Effect of water storage on the flexural properties of E glass and silica fiber acrylic resin composite. Int J Prosthodont 1998;11:340-50. 37. Vallittu PK. 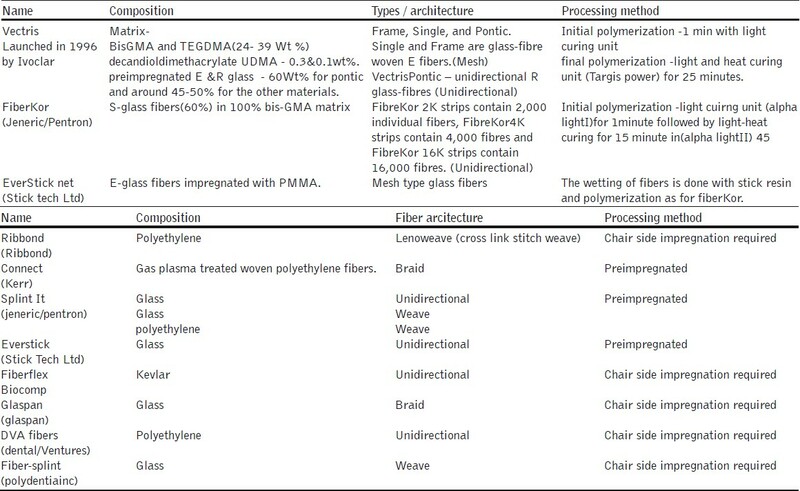 Compositional and weave pattern analyses of glass fibers in dental polymer fiber composites. J Prosthodont 1998;7:170-6. 38. Dyer SR, Lassila LV, Jokinen M, Valliittu PK. Effect of fiber orientation on fracture load of fiber reinforced composite. Dent Mater 2004;20:947-55. 39. Chai J, Law D, Takahashi Y, Hisama K, Shimizu H. Effects of water storage on the flexural properties of three glass reinforced composites. Int J Prosthodont 2005;18:28-33. 40. Turkaslan S, Tezvergil-Mutluay A, Bagis B, Pekka K, Vallittu PK, Lassila VJ. Effect of fiber-reinforced composites on the failure load and failure mode of composite veneers. Dent Mater 2009;28:530-6. 41. Dyer SR, Lassila LV, Valliittu PK. Effect of cross sectional design on the modulus of elasticity and toughness of fiber reinforced composite. J Prosthet Dent 2005;94:219-26. 42. Ellawaka A, Shortall A, Shehata M, Marquis P. Influence of veneering composite composition on the efficacy of fibre reinforced restoration. Oper Dent 2001;26:467-75. 43. Bae JM, Kim KN, Hattori M, Hasegawa K, Yoshinari M, Kawada E, et al. Fatigue strengths of a particulate filler composites reinforced with fibers. Dent Mater J 2004;23:166-74. 44. Vallittu PK. Ultra-high-modulus polyethylene ribbon as reinforcement for denture polymethyl methacrylate. A short communication. Dent Mater 1997;13:381-2. 45. Leinfelder KF. New developments in resin restorative systems. J Am Dent Assoc 1997;128:573-81. 46. Terry DA, Touati B. Clinical considerations for aesthetic laboratory fabricated inlays/ onlay restoration a review. Pract Proced Aesthet Dent 2001;13:51-8. 47. Kakaboura A, Rahiotis C, Zinelis S, Al-Dhamadi YA, Silikas N, Watts DC. In vitro characterization of two lab - processed resin composites. Dent Mater2003;19:93-8. 48. Gohring TN, Gallo Luthy H. Effect of water storage, thermocycling, the incorporation and site of placement of glass fibres on the flexural strength of veneering composites. Dent Mater 2005;21:761-72. 49. Matsumura H, Tanoue N, Atsuta M, Kitasawa S. A metal halide light source for laboratory curing of prosthetic composite materials. J Dent Res 1997;76:688-93. 50. Satsukawa H, Koizumi H, Tanoue N, Nemoto M, Ogino T, Matsumura H. Properties of an IRC material polymerized with two different laboratory polymerizing systems. Dent Mater 2005;24:377-81. 51. Klymus ME, Shinkai RS, Mota EG, Oshima HM, Spohr AM, Burnett Jr LH. Influence of the mechanical properties of composites for indirect dental restorations on pattern failure. Stomatologija 2007;9:56-60. 52. Suh BI. New concepts and technology for processing of IRCs. Compend Contin Educ Dent 2003;24:40-2. 53. Terry DA, Leinfelder K. Preservation, conservation, and restoration of posterior tooth structure with advanced biomaterials. Contemp Esthet Restor Pract 2004;46-61. 54. Douglas RD. Color stability of new-generation indirect resins for prosthodontic application. J Prosthet Dent 2000;83:166-70. 55. Komine F, Kobayashi K, Saito A, Fushiki R, Koizumi H, Matsumura H. Shear bond strength between IRC and zirconia ceramics after thermocycling. J Oral Sci 2009;51:629-34. 56. IkedaM, Matin K, Nikaido T, Foxton RM, Tagami J. Effect of surface characteristics on adherence of S. Mutans Biofilms to IRC. Dent Mater 2007;26:915-23. 57. Quinn JB, Quinn GD. Material properties and fractography of an indirect dental resin composite. Dent Mater 201;26:589-99. 58. Mirmohammadi H, Kleverlaan CJ, Feilzer AJ. Roating fatigue and flexural strength of direct and indirect resin-composite restorative materials. Am J Dent 2009;22:219-22. 59. Jain V, Platt JA, Moore BK, Borges GA. In vitro wear of new indirect resin composites. Oper Dent 2009;34:423-8. 60. Montenegro AC, Fernandes de couto C, Ventura PR, Gouvea CV, Machado AN. In vitro comparative analysis of resistance to compression of laboratory composites and a ceramic system. Indian J Dent Res 2010;21:68-71. 61. Faria AC, Benassi UM, Rodrigues RC, Ribeiro RF, Mattos MG. Analysis of the Relationship between the Surface Hardness and Wear Resistance of Indirect Composites Used as Veneer Materials. Braz Dent J 2007;18:60-4. 62. Mesquita RV. Geis- Gerstorfer. Influence of temperature on the visco-elastic properties of direct and indirect dental composite resins. Dent Mater 2008;24:623-32. 63. Pereira SM, Castilho AA, Salazar-Marocho SM, Costa Oliveira KM, Vαquez VZ, Bottino MA. Thermocycling effect on microhardness of laboratory composite resins. Braz J Oral Sci 2007;6:1372-5. 64. Chung KH. The relationship between composition and properties of posterior resin composites. J Dent Res 1990;69:852-6. 65. Neves AD, Discacciati JA, Orefice RL, Jansen WC. Correlation between degree of conversion, microhardness and inorganic content in composites. Braz Oral Res 2002;16:349-54. 66. Da Fonte Porto Carreiro A, Dos Santos Cruz CA, Vergani CE. Hardness and compressive strength of IRC resins: Effects of immersion in distilled water. J Oral Rehabil 2004;31:1085-9. 67. Manhart J, Kunzelmann KH, Chen HY, Hickel R. Mechanical properties of new composite restorative materials. J Biomed Mater Res 2000;53:353-61. 68. Borba M, Bon AD, Cecchetti D. Flexural strength and hardness of direct and IRC. Braz Oral Res 2009;23:5-10. 69. Tanoue N, Matsumura H, Atsuta M. Wear and surface roughness of current prosthetic composites after tooth brush/ dentifrice abrasion. J Prosthet Dent 2000;84:93-7. 70. Yamaga T, Sato Y, Akagawa Y, Taira M, Wakasa K, Yamaki M. Hardness and fracture toughness of four commercial visible light-cured composite resin veneering materials. J Oral Rehabil 1995;22:857-63. 71. Miranda CP, Pigani C, Bottino MC, Benetti AR. A comparison of microhardness of IRC Restorative materials. J Appl Oral Sci 2003;11:157-61. 72. Condon JD, Ferracane JL. Invirto wear of composite with varied filler level, and filler treatment. J Dent Res 1997;76:1095-411. 73. Bayne SC, Taylor DF, Heymann HO. Protection hypothesis for composite wear. Dent Mater 1992;8:305-9. 74. Nakazawa M. Color stability of IRC materials polymerized with different polymerization systems. J Oral Sci 2009;51:267-73. 75. Lim Sh, Lee Yk. Changes in color and color coordinated of an indirect resin composite during curing cycle. J Dent 2008;36:337-42. 76. Papadopoulosa T, Sarafianoub A, Hatzikyriakos A. Colour Stability of Veneering Composites after Accelerated Aging. Eur J Dent 2010;4:137-42. 77. Mileding P. Microleakage of IRC inlays. An invitro comparison with direct composite technique. Acta Odantal Scand 1992;50:295-301. 78. Llena Puy MC, Forner Navarro L, Faus LlacerVJ, Ferrandez A. Composite resin inlays. A study of marginal adaptation. Quint Int 1995;126:127-38. 79. Hasanreisoglu U, Sonmez H, Uctasali S, Wilson HJ. Microleakage of direct and indirect inlay /onlay systems. J Oral Rehab 1996;23:66-71. 80. Bedran de Castro AK, Cardoso PE, Ambrosano GM, Pimenta LA. Thermal and mechanical load cycling on microleakage and shear bond strength to dentin. Oper Dent 2004;29:42-8. 81. Aggarwal V, Logani A, Jain V, Shah N. Effect of cyclic loading on marginal adaptation and bond strength in direct Vs indirect class II MO composite restorations. Oper Dent 2008;33:587-92. 82. Soares CJ, Martins LR, Fernandes AJ, Giannini M. marginal adaptation of IRCs and ceramic inlays system. Oper Dent 2003;28:689-94. 83. Lucena-Martin C, Gonzalez-Lopez S, Navajaz-Rodriguez de Mondelo JM. The effect of various surface treatments and bonding agents on the repaired strength of heat treated composites. J Prosthet Dent 2001;86:481-8. 84. Soares CJ, Giannini M, Oliveira MT, Martins LR, Paulillo LA. Effect of surface treatments of laboratory fabricated composites on the microtensile bondstrength to a luting resin cement. J Appl Oal Sci 2004;12:45-50. 85. Leirskar J, Nordbo H, Thoresen NR, Henaug T, Von der Fehr FR. A four to six year follow up of indirect resin composite inlay/ onlays. Acta Odontol Scand 2003;61:247-51. 86. Donly KJ, Jensen ME, Triolo P, Chan D. A clinical comparison of resin composite inlay and posterior restorations and cast gold restorations at 7 years. Quintessence Int 1999;30:163-8. 87. Cetin AR, Unlu N. One-year clinical evaluation of direct nanofilled and indirect composite restorations in posterior teeth. Dent Mater 2009;28:620-6. 88. Dukic W, DukicOL, Milardovic S, Delija B. Clinical evaluation of indirect composite restorations at baseline and 36 months after placement. Oper Dent 2010;35:156-64. 89. Vanoorbeek S, Vandamme K, Lijnen I, Naert I.Computer-aided designed/computer-assisted manufactured composite resin versus ceramic single-tooth restorations: A 3-year clinical study. Int J Prosthodont 2010;23:223-30. 90. Mendonηa JS, Neto RG, Santiago SL, Lauris JR, Navarro MF, De Carvalho RM. Direct resin composite restorations versus indirect composite inlays: One-year results. J Contemp Dent Pract 2010;11:25-32. 91. Signore A, Benedicenti S, Covani U, Ravera G. A 4- to 6-year retrospective clinical study of cracked teeth restored with bonded indirect resin composite onlays. Int J Prosthodont 2007;20:609-16. 92. Bartlett D, Sundaram G. An up to 3-year randomized clinical study comparing indirect and direct resin composites used to restore worn posterior teeth. Int J Prosthodont 2006;19:613-7. 93. Thordrup M, Isidor F, Hφrsted-Bindslev P. A prospective clinical study of indirect and direct composite and ceramic inlays: Ten-year results. Quintessence Int 2006;37:139-44. 94. Wassell RW, Walls AW, McCabe JF. Direct composite inlays versus conventional composite restorations: 5-year follow-up. J Dent 2000;28:375-82. 95. Pallesen U, Qvist V. Composite resin fillings and inlays. An 11-year evaluation. Clin Oral Investig 2003;7:71-9. 96. Manhart J, Chen HY, Mehl A, Hickel R. Clinical study of indirect composite resin inlays in posterior stress-bearing preparations placed by dental students: Results after 6 months and 1, 2, and 3 years. Quintessence Int 2010;41:399-410. 97. Stober T, Dreyhaupt J, Lehnung U, Rammelsberg P. Occlusal wear of metal-free ceramic-filled polymer crowns after 2 years in service. Int J Prosthodont 2008;21:161-5. 98. Lehmann JF, Spiegl K, Eickemeyer G, Rammelsberg P. Adhesively luted, metal-free composite crowns after five years. J Adhes Dent 2009;11:493-8. 99. Ereifej N, Silikas N, Watts DC. Edge strength of indirect restorative materials. J Dent 2009;37:799-806.